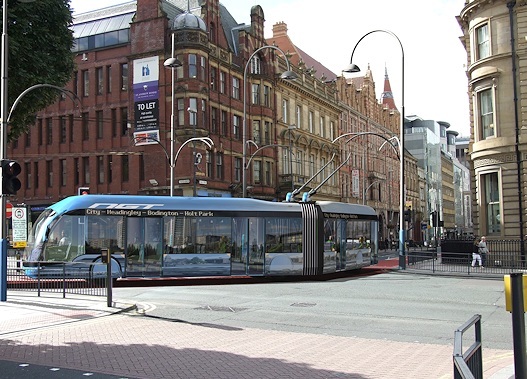 The UK's first modern trolleybus scheme is one step closer to becoming a reality for Leeds, after ministers agreed to £173m worth of government funding for the £250 million scheme. 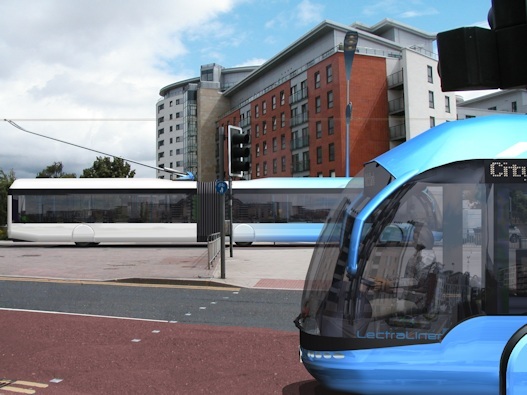 The Leeds New Generation Transport plans will deliver a high-quality rapid transport system similar to those in Athens and Lyon, to transport people into Leeds city centre. 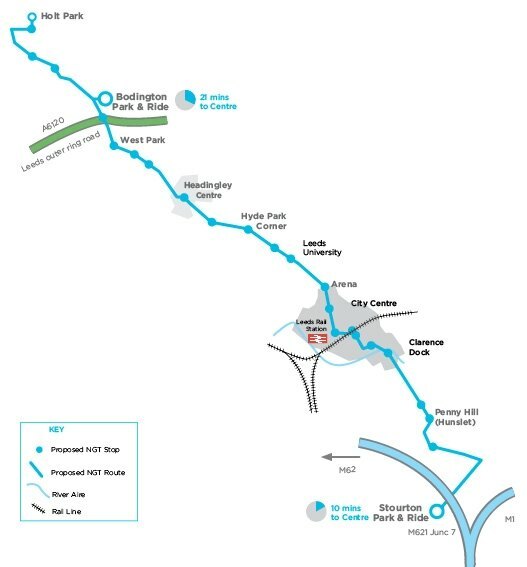 To the North, the route will run via the A660 Otley Road, with a park & ride at Bodington, on Leeds Outer Ring Road and extending beyond this to Holt Park. To the South, the route will serve new commercial development south of the City Centre and to Stourton with a Park & Ride adjacent to the M621. A possible future route the the East is hoped to serve St. James, via Quarry Hill. The Line One route is designed to reduce car useage in an enticing and environmentally benign way and thus reduce congestion and emissions both from the passenger vehicles themselves and from saved car journeys. 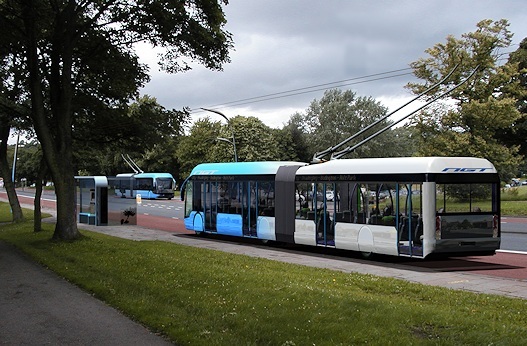 In Metro's view, this can only be achieved in a cost effective way by using high quality trolleybuses. 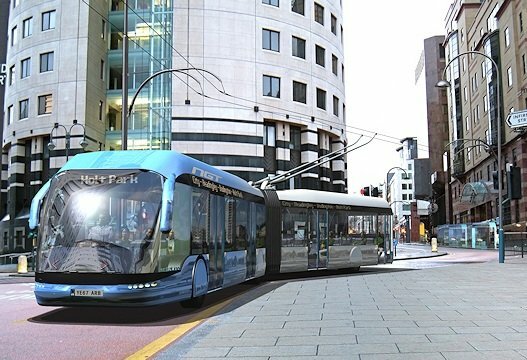 To make carrying people from the Park and Ride stations as appealing as possible, the routes will run in new, segregated busways and bus-only lanes for as much as possible of the journey. They will have first preference at traffic lights and junctions so as to make the trip fast and comfortable. Again, only trolleybuses can achieve the quietness and smoothness required in this context. 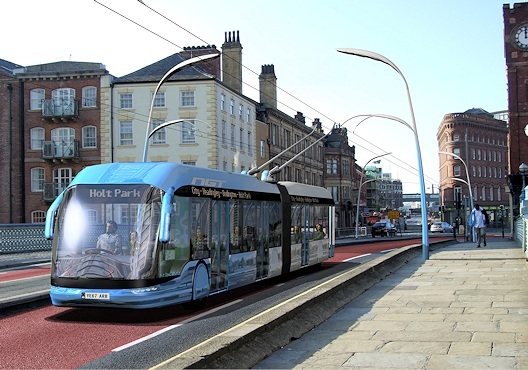 Regeneration of areas now to be served by the routes, such as Hunslet, will benefit from the permanence inferred by the overhead power supply. Business can be assured of high quality public transit as a solid basis for investment in areas that will have easy and convenient access. 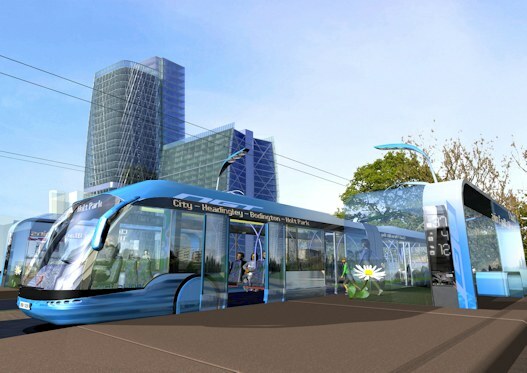 Critical too, will be routing the Trolleybus Rapid Transit to enable the car-free, revitalized retail development and housing to succeed in the City Centre. 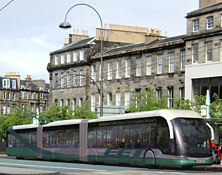 The Transit will also serve all of the Universities in Leeds. 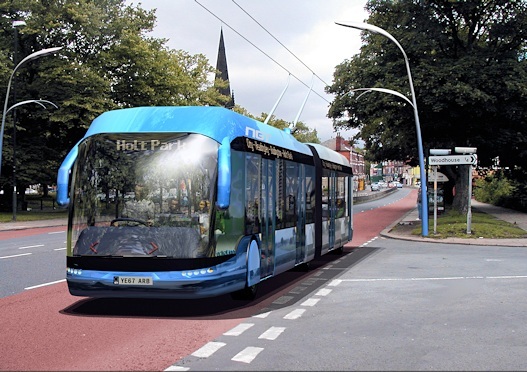 New generation trolleybus rapid transit will be able to provide world class ride comfort on relaid road surfaces that will demonstrate the potential of the technology to make a major contribution to the future of urban transportation that is both a non-emitter of greenhouse gases and a genuine alternative to car travel. By Ashley Bruce, still backgrounds by Gary Stevenson and Bruce Lake.